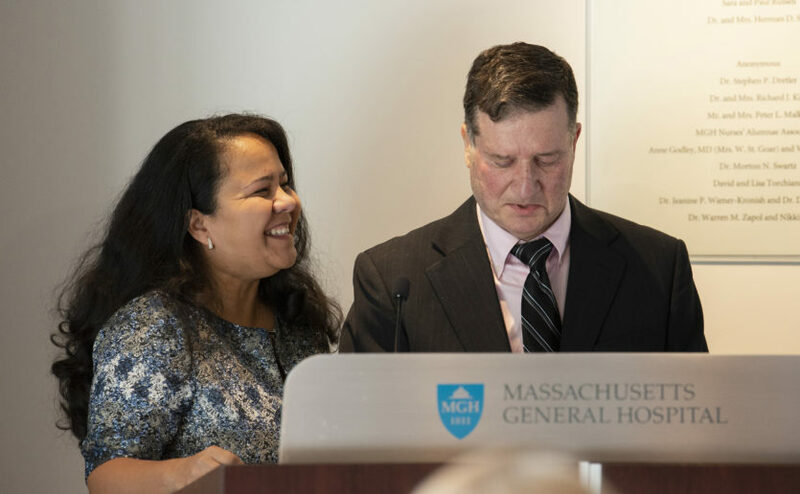 At Mass General's sixth Annual Stroke Breakfast Gala, Gaspar “Bud” Interrante (pictured with his wife) thanked caregivers for helping him recover from a stroke. A grateful stroke patient from Methuen, Massachusetts says the swift work of his expert Mass General care team allowed him to return home to enjoy his family, including a new granddaughter. Gaspar “Bud” Interrante, of Methuen, Massachusetts, loves to fish, play golf and spend time with his four grandchildren. Although Mr. Interrante, 62, leads an active life, he has experienced some challenges. Mr. Interrante lives with Crohn’s and Parkinson’s disease, and in December 2017, he hit another bump in the road. His care enabled him to go home and see his new granddaughter, who was born shortly after he experienced his stroke. While in the Massachusetts General Hospital Emergency Department (ED) for dehydration and diarrhea, Mr. Interrante began showing signs of having a stroke, including slurred speech, numbness on his left side and droopiness on the left side of his face. When it comes to stroke care, “time is brain.” Every moment is crucial in treating stroke patients because the more swiftly they are diagnosed and a specialist administers tPA, a blood clot-busting drug, the less likely they are to have long-term disabilities and further complications. “With every passing minute, 1.9 million brain cells are estimated to die,” says Natalia Rost, MD, director of the Mass General Stroke Service and associate chief of the Stroke Division. “Giving IV tPA so swiftly has certainly contributed to preserving Bud’s brain and ensuring a good outcome.” This also serves as a bridge therapy until the clot is definitively removed. During Mr. Interrante’s story at the breakfast gala, which honored him, his family and the entire Mass General care team, he explained how his care enabled him to go home and see his new granddaughter, who was born shortly after he experienced his stroke. But the coast wasn’t clear yet for Mr. Interrante. On Jan. 29, 2018, he received a call from the Cardiology Unit at Mass General explaining he needed to rush to the ED to receive a pacemaker. Specialists detected an issue through a heart monitor he had been wearing for 30 days. Mr. Interrante plans on getting back on the golf course this summer and spending ample time with his grandchildren. To learn more about how you can support stroke care and research at Mass General, please contact us.